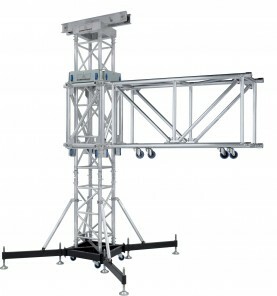 Eurotruss adds to the existing TD35 and TD44, the TD50 Tower System. The TD50 Tower is designed for extreme heights and high loads. The TD50 Tower System in combination with MT / TT / XT can go up 20 meters (65,52ft) and handles 8000kg (17637lbs). The TD50 Tower is the standard Tower System for the new MT Roof. A two Ton double chain hoist Top Part with 4 wheels for high load bearing. The Top Part has integrated pick up points for »dead hanging«. The mast sections have dimensions of 510x510mm (20,08x20,08in. The main tube is 60x 5mm (2,36 x 0,2in) and the braces are 30x3 mm (1,18 x 0,12in). One side has additional ladder braces (40mm /1,57in) for easy and safe climbing. A strong and cost effective solution to erect the TD50 Tower. The hinge sets are half connectors with a hinge fork which allow high vertical load. 4 Hinges are required per tower. The sleeve block is a fixed MT Block or a TT / XT Corner Block with usage of 2 bolted sleeve plates. These blocks make it possible to fit the TT/XT/FT100 Truss to all 4 sides by using bolted receivers. The upper plate is equip- ped with an integrated pick up point. A Steel Base on wheels with short or long outriggers in combination with stabilizer bars.